OK. It’s time to detox, after that amazing Loaded Granola Skillet Cookie. It was good, right? But you know how I am all about “everything in moderation”, so today we’re eating clean. That means lots of veggies with fiber and phytochemicals – that’s a fancy word for plant compounds that do some really good work protecting your cells from damage. Probably from the sugar and butter in that cookie, but let’s not worry too much about that right now. Cell damage can come from a diet that’s too high in bad fats and refined sugars, but it can also come from the air we breath, skin damage from the sun, chemicals we’re exposed to every day, yada yada. It’s impossible to avoid damage from these free radicals, but eating more plants really does help to protect us to some degree and keep our immune systems running strong. 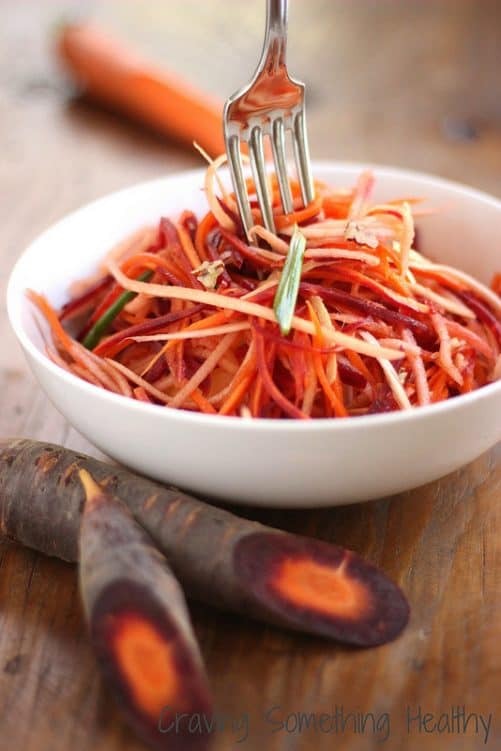 So, on that note… Remember those beeeautiful maroon carrots I used in my warm lentil salad? Well, they’re back! This time, I just shredded them, along with some other delicious things to make “noodles”. I used my mandoline to shred, but you can also use a spiralizer (if you’re lucky enough to have one), or even just a julienne peeler like this one. Isn’t this a beautiful “noodle” salad to serve with grilled salmon, or chicken? Or just toss it with some cooked grains for a veggie/detox dinner. Peel and shred the vegetables and apple using a mandoline or other shredding tool. Peel the ginger and shred about a tablespoon (or more or less to taste). Slice the scallions on the diagonal, into 2-inch pieces, and then slice each piece in half the long way. Place everything in a bowl, and toss with pecans to combine well. Mix together vinegar, syrup, olive oil and season with salt and pepper to taste. Pour dressing over salad and toss to coat well. Refrigerate for about 30 minutes to let flavors develop, and serve. Have you found any new and exciting vegetables at the market? This post contains affiliate links. If you purchase something through one of my amazon links, I will receive a small percentage of the sale, which helps to offset the costs of running this blog. Thanks for supporting Craving Something Healthy! What a beautiful salad! I have the julienne peeler – I’m running out of room in my kitchen so no veggie spiral machine 🙂 It works okay but I’ll bet a mandolin is better. I make zoodles a lot. Zuchinni noodles that my family loves. I don’t think they realize they are not pasta! Beautiful post! I just got a spiralizer for Christmas and LOVE it! 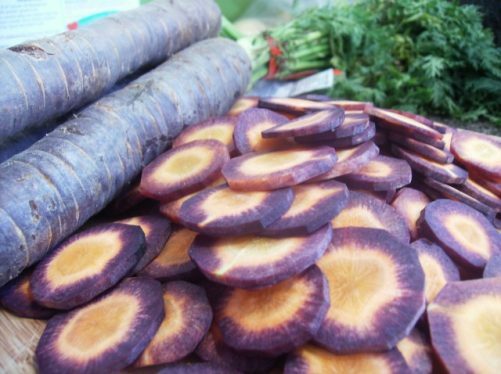 And those purple carrots are gorgeous. Sounds like such a fresh salad to try! Thanks Emily – Hope you like it! I love that your husband gave you a spiralizer! Cooking gadgets are my favorite kind of gift too 🙂 Enjoy! Perfect timing! I just bought a spirilizer and can’t wait to make all kinds of yummy dishes including this one. Thanks for stopping by Sara – Hope you enjoy the recipe and have fun playing with your spiralizer – it’s the best invention! 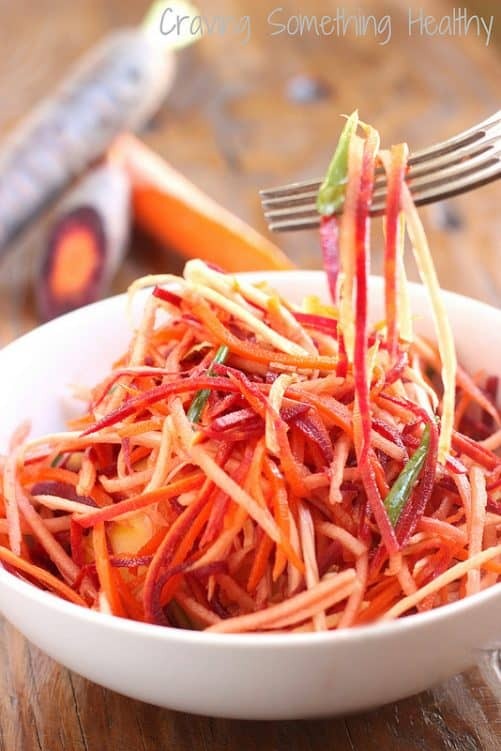 Love the thought of fresh ginger in an apple carrot salad. 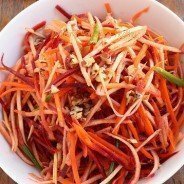 I make apple carrot salad for my kids at least 3x per week thru winter. Now I know how to jazz it up! Just added this recipe to The Recipe ReDux FB page!